Mark was born in Birmingham and joined Aston Villa as an apprentice in 1980, turning professional a year later. He quickly established himself as a first team regular and made 181 appearances for Villa, scoring 39 times. Despite suffering relegation in 1987, Walters’ form for Villa in the first half of the 1987/88 season saw him attract the attention of a number of big clubs. As you’ll remember, at that time the Souness revolution was taking shape at Rangers and Mark became the latest player to join the influx of English players moving north of the border. He had the ability to ghost past defenders, tying them in knots with his twisting and turning, and his ‘Double Shuffle’, a skill he had honed since his childhood, became a feature of his game. Although most defenders expected it, they were unable to stop it. 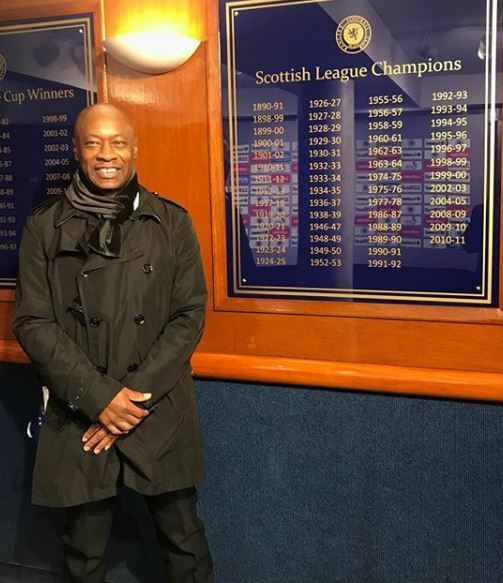 Although the remainder of the 1987/88 season produced no silverware, Walters enjoyed a fruitful first full season in Scotland, as he picked up a League Championship medal and a winners badge in the Scottish League Cup. He scored seventeen goals in forty-eight appearances and included in his haul were four league goals against Celtic and a double in the semi-final of the League Cup against Hearts. The 1989/90 saw Walters make the number 11 jersey his own, and he enjoyed another fine campaign, scoring twelve goals and picking up a second Championship medal. A third followed in 1990/91, and we all remember Mark’s cross that set up the first of Mark Hateley’s two goals in the final day title shoot-out against Aberdeen at Ibrox. Walters also scored the opening goal against Celtic in the League Cup Final, a match that Rangers won by two goals to one. His time in Scotland was not without its hardships, though. Mark was subjected to vile racist abuse at regular intervals. The fact that Mark was able to rise above this odious abuse and turn on the dazzling displays that he did spoke volumes for his strength of character. After making 143 appearances and scoring fifty-two goals, Mark Walters left Rangers in the summer of 1991 to join Graeme Souness at Liverpool. The winger, who cost Liverpool £1.25 million. Mark’s only cap for England was earned during his final season with Rangers. Mark spent five years at Anfield, winning the FA Cup in 1992 and the League Cup in 1995, before moving on to Southampton, Swindon Town and Bristol Rovers. Since retirement, Mark has been involved in coaching kids, and has consulted with groups aiming to eliminate racism in football.